I’ve hunted, fished and trapped most of my life, I’ve been blessed to make a living in the outdoors. Once I got out of the Army (82nd Airborne Division) I knew I wanted to be a Taxidermist which opened the doors to a ton of outdoor opportunities. I’m a charter boat Captain on Lake Erie and run a trap line every winter. I fell into becoming an outfitter in Iowa (www.theoutfittersonline.com) which opened the door to my Television carrier and launched a new career path. I’ve had the opportunity to work with some of the legends of the TV world, having started my own television show (Factory to Field) gave me places to hunt most guys just envy ! For many seasons we traveled the roads and factories and showed how our outdoor products were made and used in the field. 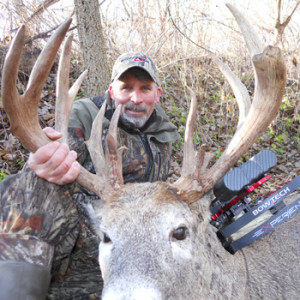 I was one of the fortunate ones and sold the show, keeping all my ties in the outdoor world gave me tons of places to harvest giant Whitetail. Don’t get me wrong, I love hunting all game with my Bow but Whitetail are my favorite! Nebraska has been by far my best place to harvest giants, I hunted some of the Indian reservations in Nebraska as well, there were years I would take 2 maybe 4 different record book bucks, all with Archery equipment! And yes you can harvest that many in Nebraska you just gotta hunt the reservations as well. Family and Friends are what I’m all about anymore, my Daughter was on my TV show and now my Grandson is my new outdoor buddy. That’s why I’m a Bowtech junkie! !